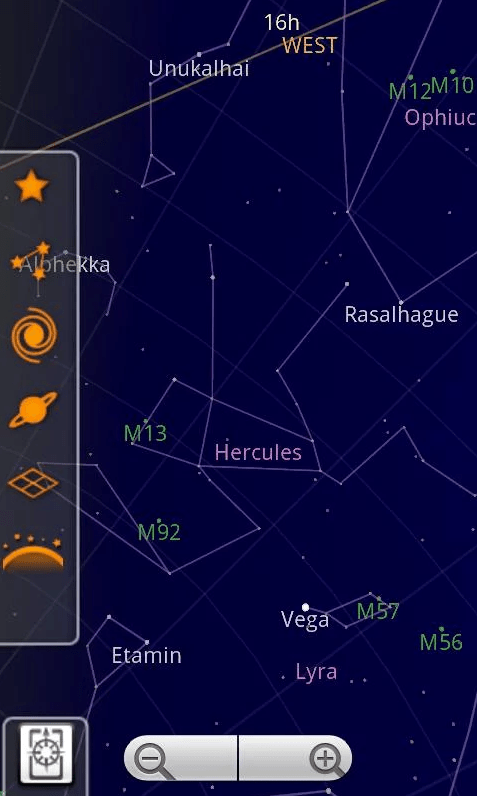 Google Sky Maps uses your phone’s orientation tools to give you an accurate representation of the stars and planets on your screen. Point your phone at the sky, then learn what constellations are visible. It uses a combination of GPS, compass and accelerometer technology, allowing you to navigate the night sky and find stars and constellations (even from inside as you lay in your bed at night). When you open the app you’ll be prompted for your location, which you can either enter manually or let your phone use GPS (or your network) do the work. Then you’ll be presented with a view of the night sky which changes in real time, responding to the movements of your phone. The view on your android phone will correspond directly with what you’re looking at in reality (if you have super eye sight), but in addition the images on your phone or computer display will include the names of planets, stars and constellations. All of this information is presented on different layers that can be turned on and off at will. So if you only want to view planets in the sky, you can switch off all other layers. If you’re searching for a particular star then you can choose to only have that layer visible. You can also search for objects by typing in a name which will bring up the on-screen guide showing you which direction you need to point your phone in. Sky Map obviously isn’t going to replace Google Maps for us mere mortals, but it is certainly an extraordinary tool for exploring the stars from home.